Love the idea of making handcrafted wire jewelry but just don’t know how to begin? 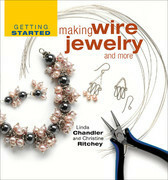 Getting Started Making Wire Jewelry can teach you! More than 100 color photographs and illustrations walk you, step by step, from where and how to shop for wire and beads, choosing the right kind and gauge of wire, to what tools-of-the-trade you’ll need to borrow or buy. How to make basic jewelry components such as loops, jump rings, findings, and connectors and then create one or all of the 6 projects including earrings, rings, a bracelet – or decorated cards. An abundance of tips and resources will keep those ideas flowing. With Getting Started Making Wire Jewelry as your guide, you’ll master the art of creating beautiful wire jewelry and gifts in no time!